Use when you need an authorization for an action. For example, you can send an email request to several recipients seeking their approval of a project proposal. Use when you need either a yes or a no. This is a good way to take a quick poll. Use when you don't want to limit the choices to yes and no. This voting option offers an alternative response. Use to create your own custom voting button names. For example, you can ask your colleagues to choose among three days of the week for a recurring weekly staff meeting. Important: If you apply Information Rights Management (IRM) permissions (Options tab > Permission command) to a message, the recipient won’t see the voting options. The sender can see all responses in a table. On one of the response messages, click the The sender responded line in the message header, then click View voting responses. Open the original message with voting buttons that you sent. This message is usually located in the Sent Items folder. On the Message tab, in the Show group, click Tracking. Note: Tracking doesn't appear until at least one recipient of the email message has replied with his or her vote. When you create and send an email poll to others, you may want to track and print the results. You can either quickly copy the voting results into a blank Word document or a new email, or copy them into Excel so you can work with the data later. 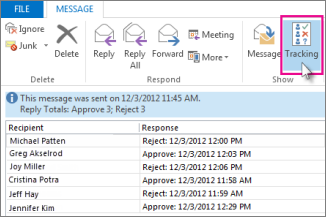 In Outlook, in the Sent Items folder, open the email message you sent that contains the voting poll. Tip: The Tracking button doesn’t appear until at least one vote has been cast. In Word, click Blank document, and then click Paste. In Outlook, click Home >New Email, and then click Paste. Click File > Print, specify a printer, and then click Print. On the keyboard, press and hold Ctrl, and then click and drag the mouse to select all names and responses in the list. On the keyboard, press Ctrl + C.
Open Excel and choose Blank workbook. Right-click the top-left cell, and then click Paste. To adjust the columns to fit the text, place the cursor between the column headers and double-click. Note: A Microsoft Exchange Server 2000, Exchange Server 2003, or Exchange Server 2007 account is required. Most home and personal accounts don't use Microsoft Exchange. This option is best when you need an authorization for an action. For example, you can send an email request to several recipients seeking their approval of a project proposal. When all you need is either a yes or a no, this is a good way to take a quick poll. When you don't want to limit the choices to yes and no, this voting option offers an alternative response. Create your own custom voting button names. For example, you can ask your colleagues to choose among three days of the week for a recurring weekly staff meeting. In the Message Options dialog box, under Voting and Tracking options, select the Use voting buttons check box. Select and delete the default button names, and then type the text that you want. Separate button names with semicolons. Click E-mail Options, and then click Tracking Options. Select the Process requests and responses on arrival check box. A blank response is a message that contains no comments from the sender other than a vote. Note: To review the responses in your Inbox before they are recorded, clear the Process requests and responses on arrival check box. Note: Tracking does not appear until at least one recipient of the e-mail message has replied with his or her vote. Click the first row, hold down SHIFT, and then click the last row. Click the first row, hold down CTRL, and then click additional rows. Select a cell, and then press CTRL+V.